as an american my only issue with 'mr. star" is why is his "morpher" a cheese burger?! i mean come on its just silly! i happily accept the guitar, rodeomaru and bisonmaru, even his cowboy uniform. thats really the only thing i dislike about him. i thought it was cool how he snags selfies right before the yokai blows up. his otominin seemed clever enough, even their gattai. just the cheeseburger cellphone ... no. Is the red ranger really that bad? 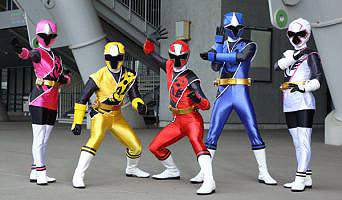 I have not yet watched any if this Sentai yet, but I ended up abandoning kyoryuger because Daigo got shoved down my throat too much and I really never found him likeable. If you don't like Daigo, Takeru will definitely rub you the wrong way. Sounds like the series is another miss for me then. Takeru is definitely worse than Daigo, and Daigo was pretty tolerable. Takeru has no redeeming qualities at all.